This article relates to a rare payment issue which can occur in PayPal and gives instructions for how it can be resolved. 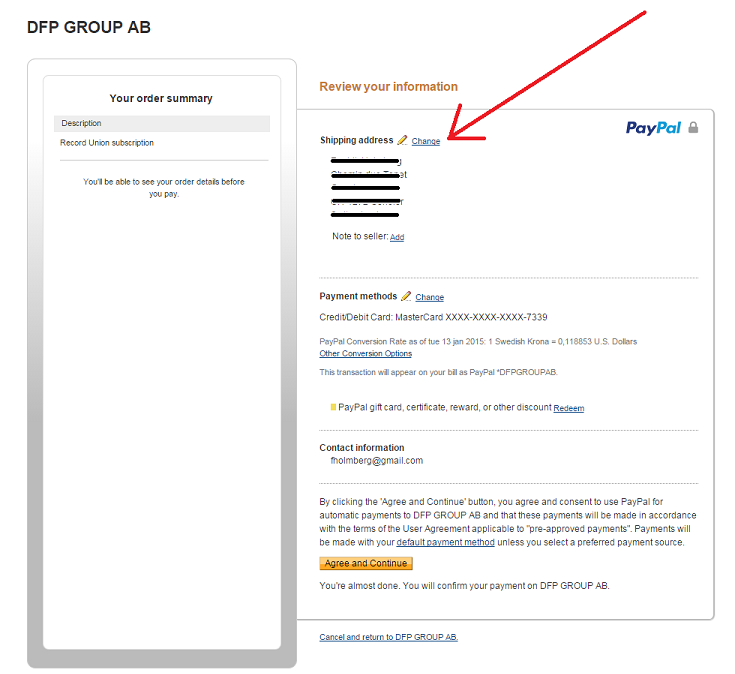 Depending on how your PayPal account is set up, the "Shipping address" which shows in the "Review your information" page in the PayPal payment window can sometimes be in a different country than the account registered to your PayPal account. This is not allowed by PayPal for the types of payments made on Record Union and will cause the payment to not complete successfully. On the "Review your information" page in the payment flow, click "Change" and update the shipping address so it matches the country in which your PayPal account is registered to. Note, if none of your saved shipping addresses are in the same country as your PayPal account is registered to then you can add a new address instead.